Aloha from the mainland, friends! Brian and I returned to Jackson Hole about a week and a half ago now, to FULL ON WINTER!! It has been snowing, freezing at night and on a good day, creping up to 50 in the sun mid day - whoop, whoop! I am none too pleased about putting my bikini in a drawer in favor of a wool hat, long underwear and SHOES, so I repeat the following mantra: "It's 82 degrees and sunny" while keeping my fingers crossed that the foot of snow lingering in our backyard will melt before June. In the meantime, Brian has been working hard to get his window washing biz back on track. The calls are flooding in and this season is looking as if it will be a big one! I have been going to the pool (I close my eyes and imagine it's a chlorinated ocean), doing my exercises and walking on pavement and simulated sand - the snow. I am feeling good and have been inspired to start two businesses (making natural body products and offering professional handwriting and calligraphy services - stop laughing!). My third job will be managing All American Window Cleaning Services - Bri's business. Damn...I better get to work! We had a FANTASTIC time on the Salt River in Arizona - the six day multi-day "transition trip" we took after leaving Hawaii, but before returning to Wyoming. The whitewater was rowdy and constant, the food plentiful and scrumptious, the beer flowed like water and the sun beat down on us almost the entire time - it doesn't get much better! We went with a great group of people, ranging in age from 25-65, including a doctor, two fishing guides, a massage therapist, a scuba instructor, a bike shop owner and an X-NFL player. The HUGE Saguaro's kept watch over us the entire trip. We managed NOT to run into a single scorpion or snake - YEAH! 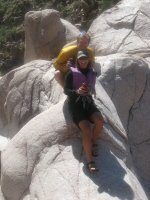 We did however, spot a Gila Monster climbing up a rock...COOL! For "Hawaiian theme night" our friend Dave put on the grass skirt and coconut bra we brought him from China Town and entertained us by attempting to follow the enclosed hula instructions. You would have loved it! I've attached a few pics of the trip for you to check out. Hope you are all well. MISS YOU LOADS!! COME VISIT! Sounds like a nice trip. Though arriving home to a summer of work just when the weather is getting good, doesn't thrill me. But I do know Brian has a good work ethic, at least until Memorial Day.